One of my favorite things about the work that I do - my writing, my speaking, my media/blogging work, and my work with the National Catholic Partnership on Disability - is the amazing people I've gotten to know. One of the other things that I love about Jeannie is how she uses her theological knowledge to lead others on their journey to God - especially those in the midst of pain and suffering. Jeannie is no stranger to suffering in her own life, and she has written beautifully in her previous books about the grace that can be found in the midst of it. She has used her own experience as a caregiver of a child with special needs to help other parents navigate those waters. And she's also written about the process of grieving and finding hope in the midst of it. 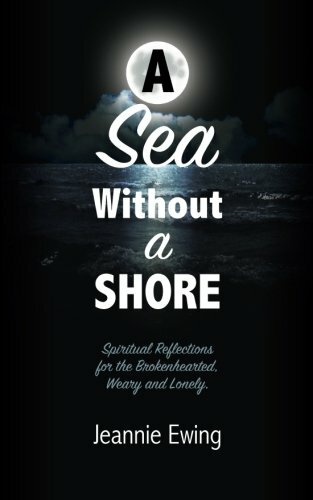 In her latest book, A Sea Without a Shore - Reflections for the Brokenhearted, Weary, and Lonely, Jeannie offers her usual depth in the form of a devotional. This isn't an academic theological work on suffering - it is a work of deep reflections, meant to help those in the midst of difficult challenges find hope. "Everyone experiences suffering and trials throughout life, whether in the form of death or significant loss of a relationship, finances, a home or job, and even a pet. Loss affects us all, and we are often left feeling empty, lonely, and lost in the midst of such excruciating darkness. Others may attempt to ameliorate our fears, concerns, and struggle, but to no avail. Even our faith may seem to fail us. Jeannie Ewing understands that holy darkness may veil us in a cloud of unknowing for a time, but we don’t have to capitulate to despair. Instead, we can journey through the mysteries and misunderstandings through the eyes of faith. In A Sea Without A Shore: Spiritual Reflections for the Brokenhearted, Weary, and Lonely, you will find a familiar friend journeying with you throughout the often murky and tumultuous waters of grief. No matter the cause of your pain and strife, this devotional will offer short but poignant insights that open your heart to God’s love and mercy." I received a copy of this book in exchange for my review, and I will tell you...if you are in the midst of loneliness and suffering, looking for a way to address this in your prayer life, this book is definitely worth a look! You can find her book in paperback and Kindle form here.